Instagram just made it easier for you to verify your Instagram account. Now you won’t have to avail of those shady Instagram verification service just to get that highly-regarded blue tick. This article will guide you on how to get verified on Instagram for free. People used to buy Instagram verification service just to have that precious blue tick on their names. Aside from being highly likely that these services are nothing but scams, users may get their Instagram accounts at risk especially if the service requires users to provide their Instagram username and passwords. We can safely say that people who offer services and hacks to get verified on Instagram are only there to steal your money and your account details. For the longest time, Instagram did not clearly give ways for users to get a verified account. Only famous celebrities and businesses are rewarded with the verified icon. Now, things are changing. Instagram has made it easier for users to get verified on Instagram. The next sections will help you get that blue tick on your account. • Account legitimacy. The Instagram account must be legit. You cannot just make a “NikeOfficial” account, get a large following, request for verification and get approved. You must prepare a proof of business ownership or personal identification items to support your legitimacy claim. • Large following. The Instagram account must have a sizeable amount of followers. Though Instagram does not openly give an exact figure, the number of followers must at least be on four digits. • No illegal activities. Your Instagram account must not be engaged in fishy activities such as spamming and buying Instagram followers. We have a detailed article that outlines the best practices to get verified on Instagram. You can check the article out for more details. 2. With Instagram opened, click on the Profile icon located on the lower-right part of the screen. 3. Now that you are on your Profile page, tap on the Menu icon located on the upper-right part of the screen. 4. From the Menu, click on the Settings icon located on the lower-most part of the screen. 5. From Settings, scroll down and tap on Request Verification. 6. 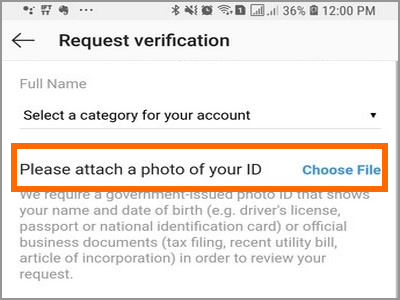 On the Request Verification page, enter your full name, another name you are known as, and the category of your account. 7. Prove that you are a real person by attaching a government-issued photo ID that shows your name and birthday. Tap on the Choose File button to attach a photo that is saved on your phone. 8. Tap on the Send button and you will now just have to wait for feedback on your account Instagram account’s verification request. Q: How long can I get my account verified? A: There is no established timeline as to when Instagram approves or rejects verification requests. Some users get feedback after a few days while others wait for months without getting a response. You just have to cross your fingers that you will get a feedback and that the feedback favors you – that is, getting an approved verification request. Again, having a notable and legit Instagram account makes it easier. Q: Is there a minimum number of followers for my Instagram account to be verified? A: Instagram has not set a minimum number of followers for an account to be verified. We have seen verified accounts with mere 5K followers while others with millions of followers remain unverified. Q: Can I use an Instagram verified emoji so that my account appears verified? A: You can tweak emojis on your phone so that you can have a blue tick emoji. However, the same emoji will not appear on other users. The emoji is only on your phone’s side. Instagram servers do not support the emoji and will not show such to other users. There are a lot of benefits of being verified on Instagram. Just make sure that your account is ready before you try to get verified on Instagram. If you have questions about any of the information above, let us know in the comments section.